Sorry for the silence over here. Life has been incredibly busy balancing corporate clients, sickness and also mother's day orders. It was a real joy making up the mother's day orders though cos it was so nice to be a part of this process of helping send love from a child to their mum on this special day. There was a particular son who was serving National Service (and in camp) who ordered a necklace from me at MAAD for his mum. He wrote a card and asked me to send it a little earlier as it coincided with her birthday. I was so moved by his gesture. I wonder if my kids will do the same when they are older. 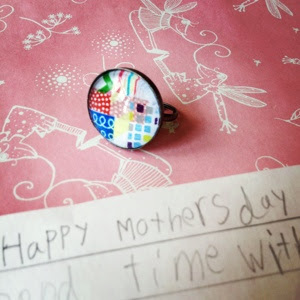 Well, today, I want to share with you a DIY that my son made for me for Mother's Day. He was a little upset as my younger son had come home with a number of mother's day gifts for me (helped by the school that he goes to). My older son, Jaeden didn't have anything and really wanted to give me something too. So I gave him a little diy project. 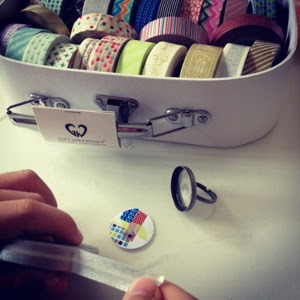 I told him he could make me a ring using the washi tape. 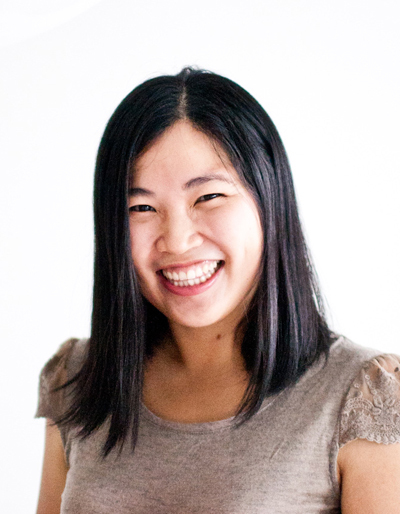 Washi paper tape is quite the rage at the moment. If you haven't seen it, it is decorative tape made from Japanese washi paper that can be peeled off easily without damaging surfaces. Step 1: I first used a circle paper punch to punch a piece of white paper for him to work with. 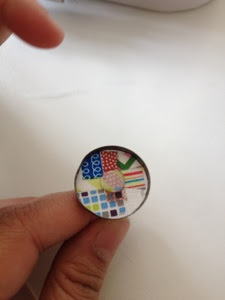 Step 2: I told him to cut and stick washi tape all over the white paper circle. He tried to cut them really small so he could squeeze in as many patterns as possible. He had a lot of fun cutting and sticking. 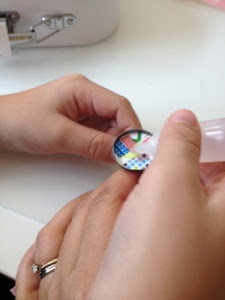 Step 3: We then glued the paper to the ring. Step 4: We squeezed a little blob of jelly glaze into the centre of the ring. 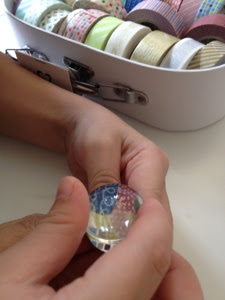 Step 5: We then pushed the glass pebble down hard on the paper so that the jelly glaze would spread out evenly. I had to press down a few times while the jelly glaze was drying to push out any air bubbles caught in between the glass and the paper. There were a few bubbles left due to the layering of the washi tape but I was happy with that cos I like the organic feel that it gives. This particular ring is not in our stores at the moment but available from our booth at MAAD. Once it is listed at our shop, we will update our fb.com/giftwrapsody page.